The story of the healing of the Paralytic is really interesting. Obviously by this time the word had gotten out that Jesus was a great healer, and those with chronic conditions like being paralyzed now had hope of a different sort of life. The Paralytic’s family and friends were likely his caregivers, and they too had the new hope that they would no longer have to care for their friend or family member. Yes they likely loved the man they brought to Jesus, but there was something in it for them too. They had a hope that their life was going to change for the better when Jesus healed the paralytic. Great – thanks a lot Jesus! Do you think the paralytic was going to be satisfied with being forgiven? What he wanted (and his friends) was that he would walk out of that place on his own. 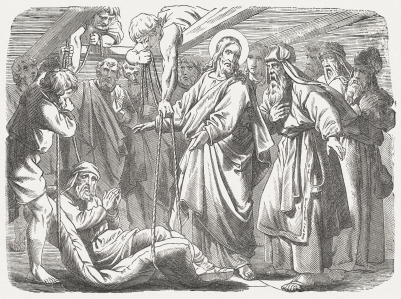 Little did they know that Jesus was less concerned with the paralytic’s physical condition than with the condition of his soul. Jesus knew that this man’s body was temporary, but with faith and forgiveness from the Lord, this mans life would continue for eternity. That’s what mattered to Jesus. Jesus didn’t heal the man for the man’s sake. He healed him so that the scribes sitting there calling Jesus a blasphemer would be able to see that Jesus had the authority to forgive sins. Jesus was showing them that He had the full authority of God the Father behind Him and that He could rule over sins, health and anything else. What a blessing! Our sins are often more debilitating than our diseases. Often the worry and stress we gain by our sins are contributing to our bad health. God is less concerned about our comfort than the condition of our heart. He wants us to be forgiven so that we might be drawn closer to Him. Often when we feel we’ve battled and won against one sin, we fall for another sin. Sins get our focus off our Lord and puts it back on ourselves. Often people ask for prayers of healing for our friends and family members, but how often do we, like Jesus, focus on what’s more important, their forgiveness. Have you ever asked for prayers of forgiveness? Have you ever prayed that someone would repent of their ways and seek God’s forgiveness? Not often, I bet. As modern Americans we don’t really like people sticking their noses in our business and we don’t want to stick our noses in theirs. We don’t want to judge, lest we be judged. But I think we may want to take a page out of Jesus book and focus on what’s really hurting that person. Not that we need to judge them per-say, but that we can pray for forgiveness for those who are struggling. That they might find the freedom to live for God that only comes after we’ve been healed from our sins. After we’ve been freed from the paralyzing nature of sin. Sin that keeps us from moving forward, closer to God and our families. Sin gets in the way. I find this to be an annoying phrase. A lot of people don’t have their health. I don’t. I know I have a disease that could eventually rob me of my mobility and make me very dependent on the people around me. That burden that is created on those around you is saddening and frustrating. I’m sure I’ll be ever pleasant and easy to work with if I ever need that kind of care (I’m never cranky or bossy now – so nothing will change). But one of the things I felt I learned by finding out I had Multiple Sclerosis is what do you do when you can’t say “at least I have my health”. I can say – “At least I have Eternal Life”. My hope doesn’t rest in the years my body works, but in the work Jesus did for me on the cross. His death that worked the forgiveness of sins is more important to me than whether or not my legs work right, if I have pain in my feet, back or head. I have a hope that surpasses human understanding that would have us focus on the physical realities of this world. God is good, even when my legs don’t work. He’s more concerned about the condition of my heart than the condition of my body. Forgiveness or Healing – which is more important to you?